So you want to partake in the K9s Smooch Your Pooch Movement? Smooch Your Pooch is an awareness and fundraising movement by K9s For Warriors. We rescue dogs to rescue post-9/11 veterans from the invisible wounds of war, such as PTSD, traumatic brain injury and military sexual assault. Your posts will help spread awareness of our mission to save veterans' lives. Smooching a pooch will give everyone who does it warm and loving feelings - happiness is contagious! When people give, we'll be able to serve more veterans in need, faster. 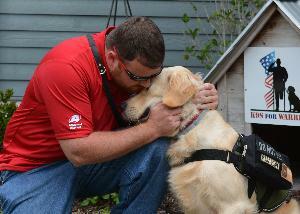 The ripple effect this has on rescue dogs, and veterans' families and friends is priceless. K9s For Warriors appreciates your help and support!